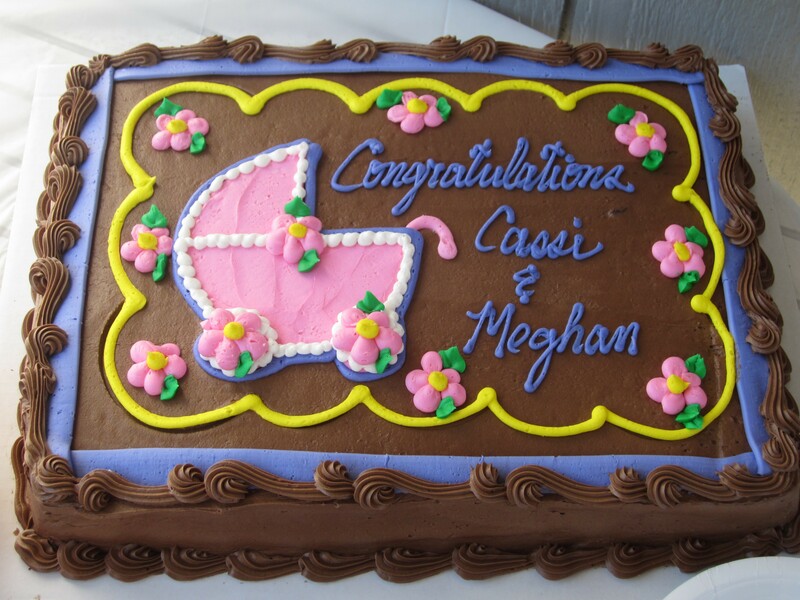 On Sunday, I went to a baby shower. 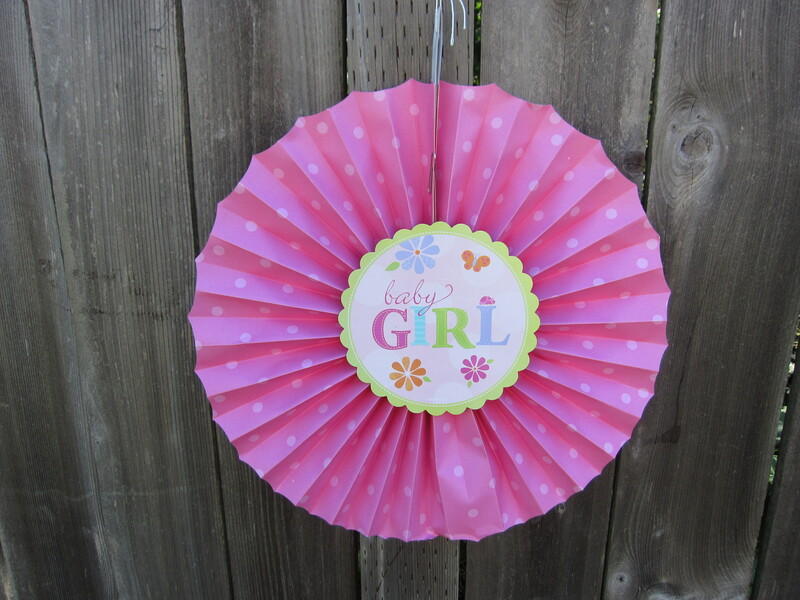 My baby shower. Well, technically, it was a joint shower, so it was for a friend expecting her fourth baby on July 31st and little ol’ me, but still…it was my shower, at least as much as hers. I remember all those months ago, when I attended my sister’s shower (just three days before learning of Skittle’s existence! ), and it was so hard to be there, with what I believed was an empty womb and a broken heart. I wondered if I’d ever get to celebrate another baby of my own. And this weekend, I did. As some of you may remember, I was feeling a little uncertain about this shower. 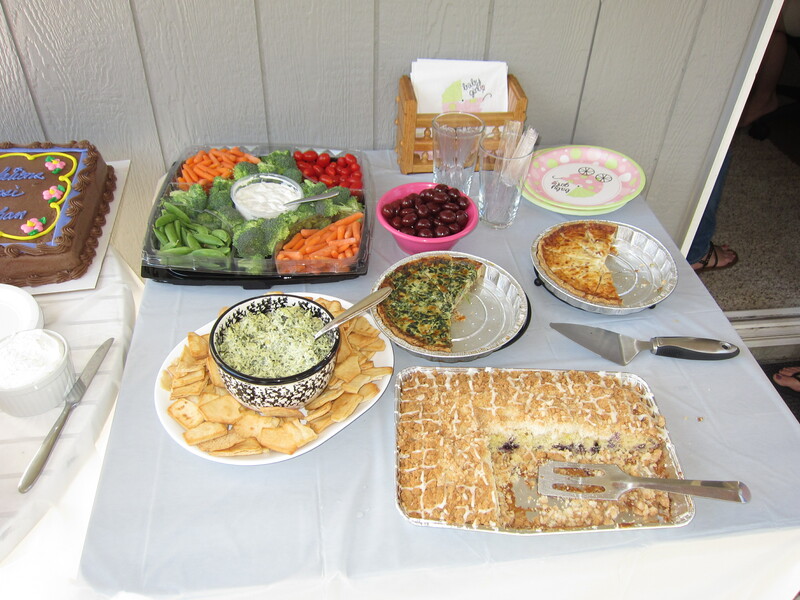 It was hosted by my close friends Lillian and Leigh, but because it was open to many moms in our mama’s group and because it was a joint shower, several of the guests I know only minimally. I’m a *bit* of a wallflower (ha! understatement of the year! ), so greeting and socializing with people I don’t know can be pretty intimidating. But in the end, I worried for naught (as usual). While I was still rather reserved and quiet, it was a lovely day and I’m happy to report I didn’t feel out of place at my own shower at all. 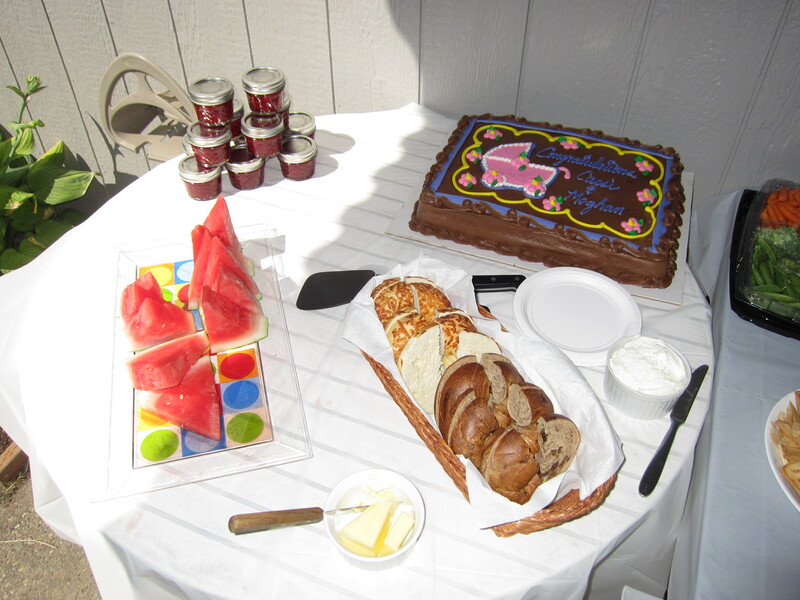 Because it was so early in the day, it was all about brunch for us ladies: watermelon, bagels, veggies, pita chips with a delicious dip, chocolate-covered cherries, two kinds of quiche, and an ah-may-zing blueberry lemon coffee cake. Can we say carb overload? And to drink, there were mimosas, including alcohol-free ones! Now you know my real name. I’m getting pretty brave, aren’t I? Chocolate upon chocolate. I could have eaten the whole thing. I didn’t, but I did let myself indulge. I took my 3-hour GTT the day before (still awaiting the results) and had been sooooooo careful about my eating all week long, so I’d say the indulgence was well-deserved. 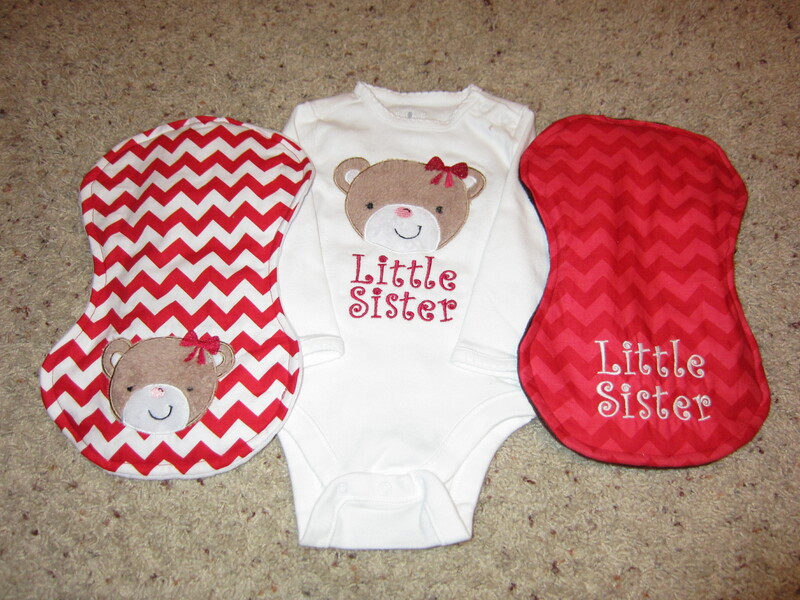 A handmade onesie with matching burp rags…all done in our teddy bear nursery theme and colors! Over the course of the morning, we had some great conversation and a lot of laughs. And for party favors, everyone got to take home a small jar of the best homemade strawberry freezer jam. 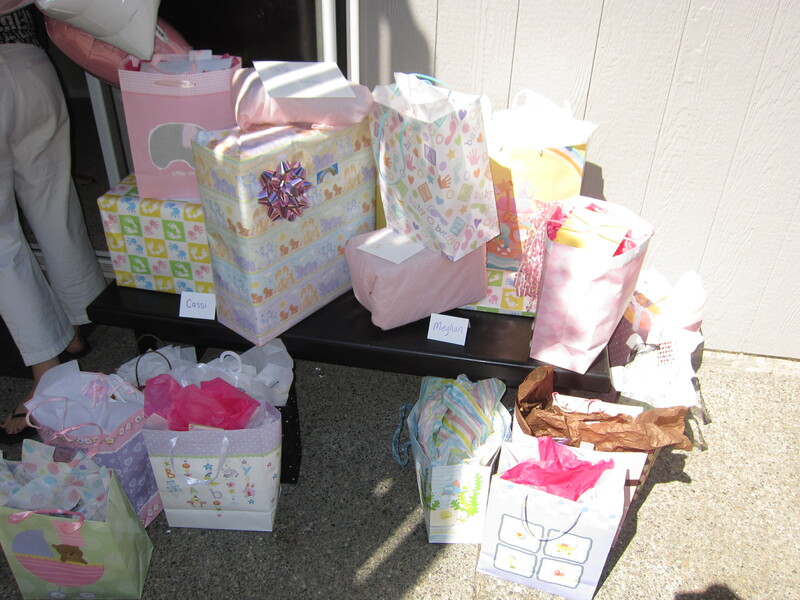 And the expecting mamas also each got a pretty little potted plant to take with them. All in all, it was the perfect party. Exactly what I had hoped it would be! 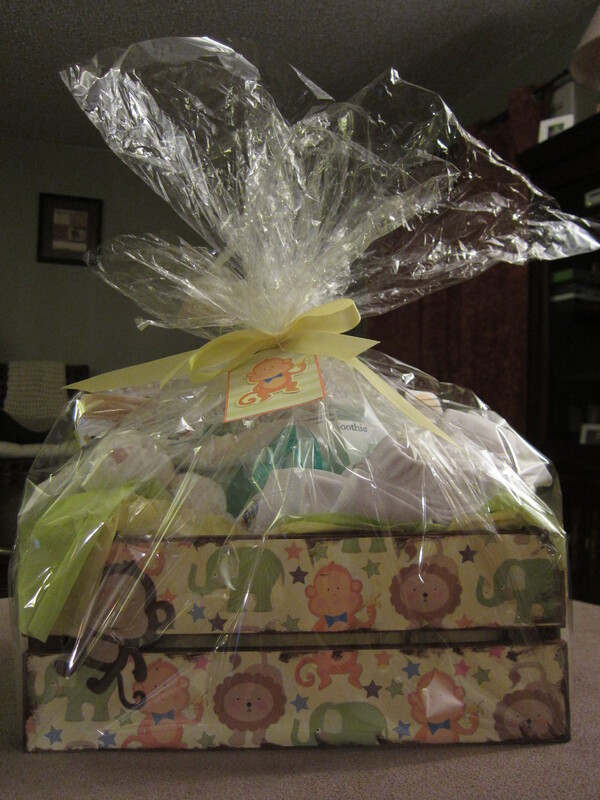 After my first baby shower, when I was pregnant with Cupcake, I mourned the idea that I may never have a shower again…not only because I’m infertile and didn’t know if I’d ever even have another baby, but also because you just never know if you’ll get another shower when you’re having a second (or third or fourth, etc.) child. So I’m incredibly humbled to have had another party thrown in my honor and extremely thankful for friends who care enough to put the time, money, and effort in to create such a fabulous event. And to show my appreciation? I sent both of our hosts a small bouquet of beautiful flowers to say thank you. I know it wasn’t expected, or even necessary, but I never want to be one who takes my friendships for granted. I’m committed to ensuring those that I care about always know how much I value them. And yesterday? I felt totally valued as well. And it was awesome. There’s a lot I want to discuss in this post, so I’ll make each topic as short and sweet as possible (though most of you know, by now, that I rarely achieve either of those — that is, shortness or sweetness). And for those of you dying to know, I’m still waiting for my period. It’s been exactly two weeks since I took my last Provera pill, and nothing yet. My temp remains elevated. Usually it will drop the day of or a day or two before I start bleeding. But today it went up. I think I’ve officially crossed over to the Worried Sick side of this. What could this mean? Anyone? Of course, I googled the heck out of it and there are lots of opinions. Almost everyone said that a period should arrive within 14 days of the last pill, some even said 7. There were only three women that I could find that had a different experience and didn’t get their period until 16, 19, or 21 days after the last pill. Really?! I mean, really? That would be so atypical for me, who has never before waited more than 10 days and even that was out of the ordinary. And I can’t wait that long! Another week??? I’m so desperate just to get on with it. I feel like I’m starting to lose my mind with all this waiting! My biggest fear, though, is not waiting another week…it’s that I have a cyst that is keeping my period at bay and which will then bench me for this cycle. I’ve had cysts before (sometimes painful ones), but they have never kept me from bleeding. In my google “research,” only two people mentioned this as a possibility, but it’s enough to freak me out. How likely is that outcome? I don’t know what to do, but if you have any input, I welcome it. I appreciate avoiding anything too “gloom and doom,” but if that’s where I’m headed, let me know. I trust you guys more than Google. Finally, if you could not tell by the title of this post, I survived the weekend. I survived the shower. But damn, was it hard. So much harder than even I anticipated, and I didn’t know that was possible. I arrived about fifteen or twenty minutes early, which was a stupid mistake on my part. There was a handful of people already there (six? seven?) and I didn’t know anyone but my sis. She said hello and hugged me…and then proceeded to ignore me for the next hour and a half. Really. For someone who is as very shy and introverted as myself, this was difficult enough, without the compounded emotions that I was feeling in being there. So I quite truly became a wallflower. I leaned against the wall and watched as my sis went around talking to everyone else and they chatted with her about all things baby and kept putting their hands on her big belly. The lump in my throat was enough to make me nauseous and I spent a good thirty minutes regretting my decision to come. I so wish my sister would have come over, squeezed my hand, and asked if I was doing okay, but that’s just not her and I knew that long before I ever came. Eventually, things did get better. Friends of my sis whom I had met before arrived and came over to chat and her aunt wanted more details about how we found each other and then the food and games began, which oddly enough actually distracted me from my own pity party. And a big, fat piece of sugar in the form of cake certainly didn’t hurt in making me feel better, either. Sissy liked her gift and, just as she opened the last of her presents, my Honey texted me to say he was waiting outside and so I had a reason to leave. Before I went, I bid my sis farewell and asked to touch her belly…because I’m crazy like that. I don’t really know why I would want to do that, except everyone else was and I didn’t want to be left out. And while touching that hard, beautifully round belly of hers shattered my heart, it also maybe made me love that little baby a tiny bit more. When we got home, I e-mailed my sis to let her know I had arrived safely and to thank her for inviting me to the shower. I told her I was sorry I couldn’t be the one to throw it for her and that I loved her. Those words aren’t something we say to each other often, but I felt they were appropriate. I wanted her to know that, while I hadn’t been the life of the party and kept very much to myself, I was trying to be there for her. I haven’t heard back from her, which hurts me to no end. I want to believe it’s just because it’s been a busy weekend, but I feel like I am constantly giving everything I have to improve and strengthen our relationship, only to hit a brick wall. But maybe I’m just being overly sensitive. It wouldn’t be the first time. After all, just last week, Sis was talking about taking a small getaway to somewhere nearby without our guys, this summer or maybe next winter. I guess we’re still just trying to figure out how this sister thing works. It’s not easy! It’s not the best photo and was much more vibrant to see with my own eyes, but I had to share this. 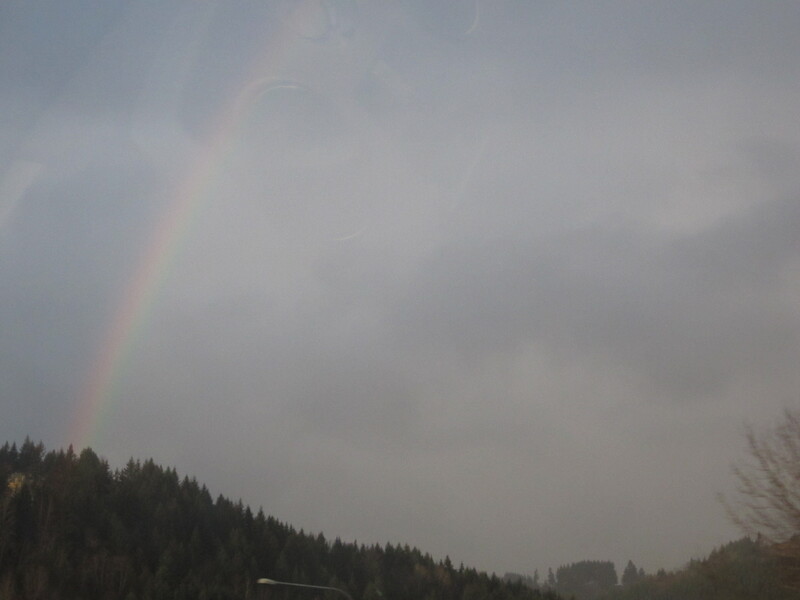 For those of you who have been reading my blog for a long time, you’ll know that I saw a rainbow (almost in the same location) on the day I learned I was pregnant with Teddy Graham. I have only seen one twice since then, always on a day when I needed it, and this time was no exception. It reminded me that there is still hope, and God is walking with me through it all — as is our beloved Teddy, forevermore. I was planning to also talk about the church service I attended yesterday, but this post is already too long (sorry! sorry! sorry!) and I want to be able to devote the time and energy it deserves. Let’s just say…it was an annual church prayer service for infertile couples and it was something. For better and worse, it was something. Stay tuned! 2) My sister’s shower is tomorrow. I will be taking a three-hour road trip (one way) to go to this. I am not excited. My husband and daughter are coming along for moral support, but they will go off to a nearby mall to play and I will be alone for the actual festivities. Well, as alone as you can be in a room full of happy, laughing, loud, celebratory women. I don’t know how hard this event will be for me, but I know it won’t be easy. There is a tight thickness in my chest every time I think about it. 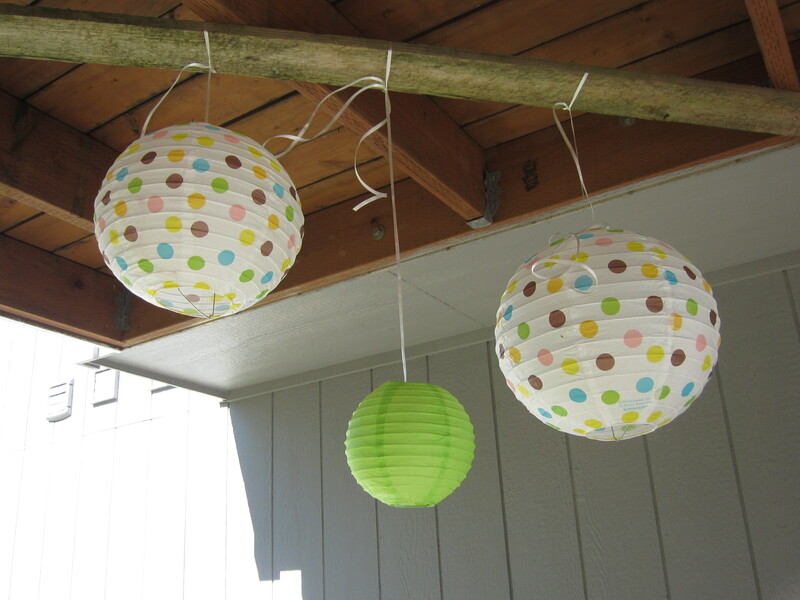 I want to enjoy it because this is a party to celebrate the impending birth of my niece or nephew (and, as someone who grew up as an only child, need I mention again how much that means to me? ), but the heartache and resentment that my sister has caused me still runs like a current beneath my skin. Sometimes I am good at ignoring it and sometimes not so much. I forgive her because I must, but it’s not so easy to forget that she burned me when I needed her the most. Nor is it so easy to forget the general pain of infertility and loss when surrounded by babyness. It will be three hours of bold reminders of what I don’t have but should. To make this day a little bit easier on myself, I have sandwiched it between three hours of fun on the road with my family. We will play my favorite music, eat my favorite snacks, and I’ll read my favorite magazines while my husband drives. I may not enjoy that small chunk of time while I’m celebrating a baby that’s not mine, but I will enjoy every other hour of Saturday. Of that, I am determined. It’s a wooden box I painted, distressed, and modge-podged to match the nursery (I hope). 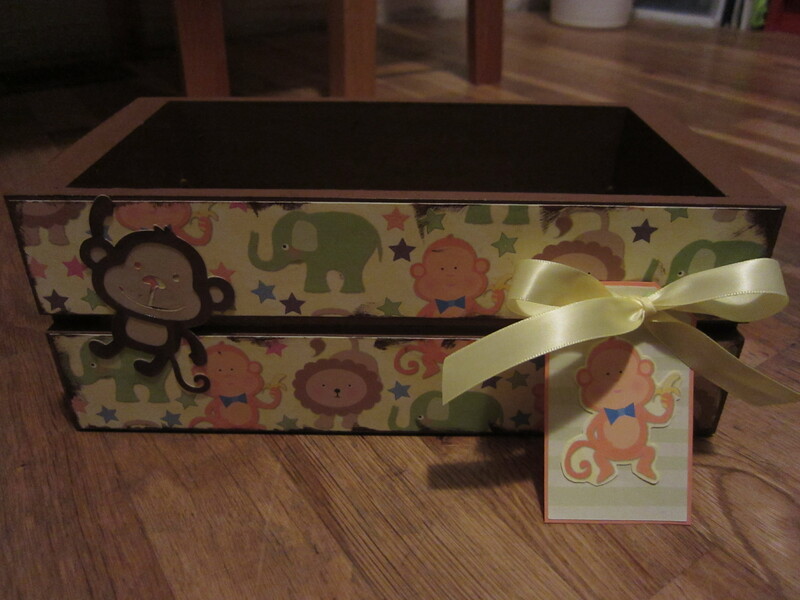 They’re doing a jungle theme (and don’t know the gender — hence, the yellows and greens), so I thought it might be nice to keep necessary supplies in it: things like diaper cream, lotion, vaseline, nail clippers. All the precious little baby items that must be corralled, or you risk them taking over your entire house. For the shower, I filled it with a bunch of stuff and wrapped it in cellophane (stating the obvious here since you can see it with your own eyes). A few of the fillers (like the outfit and toy) I bought while in London and the rest came from her registry. 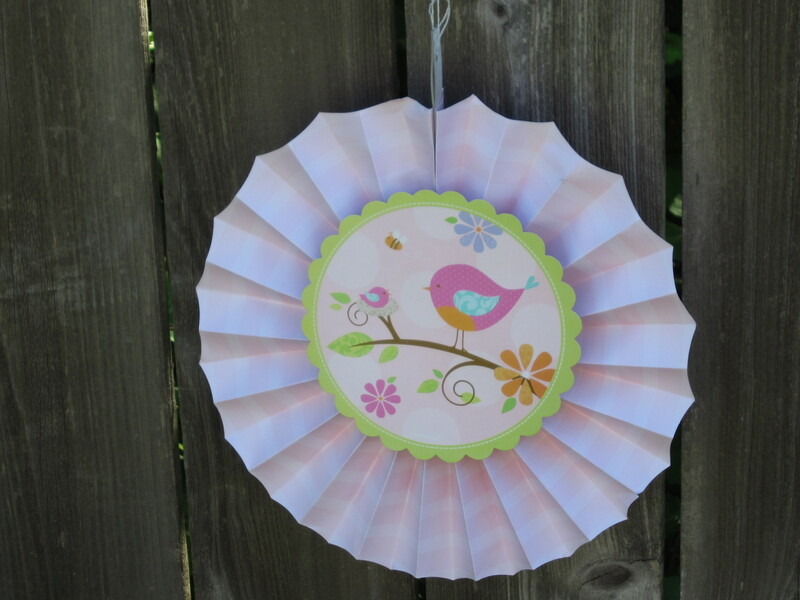 And then I finished it off with a homemade gift tag. I do hope Sis is able to fully appreciate this. Sometimes I think she fails to see how hard I try. And fails to understand what sort of love for and commitment to our relationship that I must have in order to spend hours toiling away at making this amidst my very intense heartache. I keep hoping that something I do will eventually speak to her. Maybe this. Maybe tomorrow.